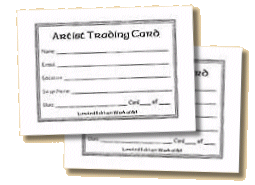 Do you want to make artist trading cards (ATCs), but feel you could use a little help? We'll give you a few pointers, and you'll soon be making and trading these masterpieces in miniature. In the first part of our look at how to make artist trading cards we talked briefly about the basics, and about ways to create backgrounds using a variety of materials and techniques. In the second part we continued by looking at themes, focal points and embellishments. Now let's take a look at how to finish, store and display your artist trading cards. When you make artist trading cards, especially if you use paint or ink, you may find that the backs of your cards are a bit messy. If you have used brads or eyelets as embellishments, these will be clearly visible on the reverse side. Whilst some artists don't mind this, others prefer to cover the backs with another piece of card or paper the same size. This can be easily attached with glue, or with thin (3-4 mm) double-sided tape, which has the advantage that it won't show through thinner or more porous materials. You may like to add a border to your artist trading card using a fibre-tip pen, just by running it along the edge. It takes a bit of practice and a steady hand, but once you have the knack it is quick, easy and very effective. A metallic border in gold, silver or copper colour can be very attractive; we find that Krylon® Leafing Pens are ideal for this purpose. Some rubber stamp manufacturers have recognised the need for a common form for these details, and have produced suitable stamps, like this example by Scottish Border Stamping. If you have a computer and printer, you may like to design your own form with a label-making program. Several manufacturers supply adhesive labels that are 63.5 x 38.1 mm, and very convenient for this purpose, but you can of course also use plain paper. Artist trading cards may be unique, 'one-of-a-kind' (OOAK) creations, or part of a limited edition or series. No two original works of art are ever exactly alike, but we use the term edition or limited edition to mean a set of artist trading cards which are virtually identical. The term series is used to describe a set of different cards based on a particular theme, or with a unifying factor. Some artists like to create a design which covers several cards, typically three to five. The complete design can be seen only when all the cards are placed together. Artist trading cards within an edition or series are numbered 'm/n' or 'm of n' to indicate the edition size, and the number of the individual card within it. Cards which are unique can be described as 'OOAK' or numbered 1/1. If you make artist trading cards, whether you are an enthusiastic swapper or cannot bear to part with your creations, you will need a system for storage and display. You need something that will protect the cards from handling and direct sunlight, keep your collection together and make it easily accessible whenever you want to look at it. You can make your own storage system, but there are also a number of commercially available products that will do the job. For individual artist trading cards there are transparent card sleeves, and also albums and album pages that fit standard A4 ring binders. Suitable albums typically contain about ten transparent pages with pockets to hold either four or nine ATCs per page, whilst each album page will take nine cards. Since artist trading cards are the same size as standard trading cards, you could try looking for transparent sleeves, albums and pages in shops and on websites which deal in this type of collectible. You may also be able to find these items at multiple stationers and some bookshops.